This morning we drove up the Angeles Crest Highway to Mt. 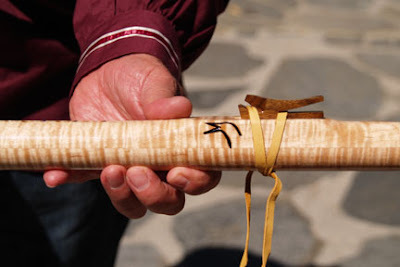 Wilson Road in La Canada to the Haramokngna American Indian Cultural Center to spend the day celebrating the Fall Equinox with flute music of the Indigenous people of the Western Hemisphere. I learned that the Indigenous people who lived in California when Columbus landed, currently own no land and are fighting the Government to be recognized as a legitimate tribe. 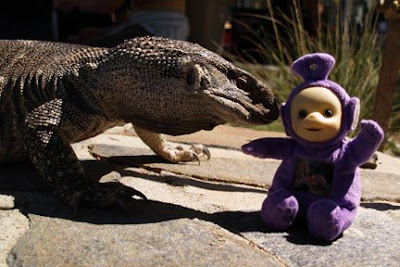 Tinky Winky got to meet a 5 foot Monitor Lizard…good thing she didn’t like eating Teletubbies. 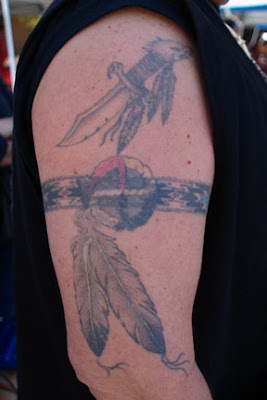 I loved this man’s tattoos…like jewelry, they seemed decorative and appropriate...they wrapped all the way around depicting an arm ban including the string tied on the inside. He told TW the center symbol stood for his wife and the feathers represented his two children. 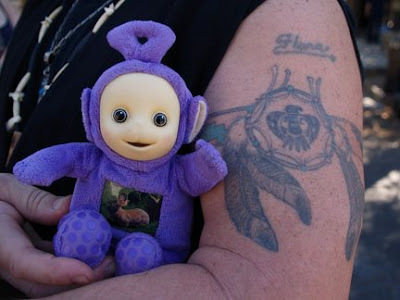 Today Tinky Winky got to attend his first Jewish wedding at a Temple in North Hollywood. In a Reform Community, both men and women may wear a yarmulke to remind one of the presences of God. 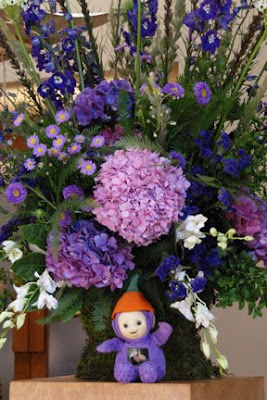 Wanting to join in the respect, TW put on his only skullcap like headgear, figuring September is traditionally the end of the harvest season, this cap would thank God for the bounty of the earth. 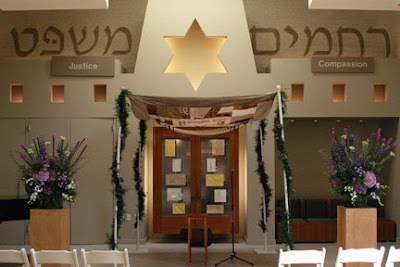 The service was filled with laughter as the Cantor had many funny stories to tell about the happy couple. 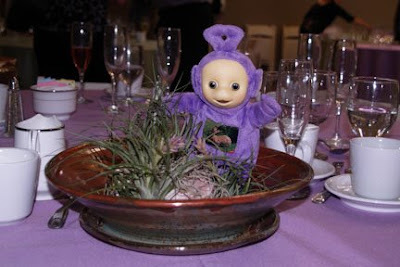 How fun to attend a wedding where you laugh. The thought just hit me, what is the sound of God? When I'm in the National Forest in Big Bear, it's the wind in the trees…and on the farm it was the song of a Meadow Lark...or at home, when my cat is tucked in under my arm and starts purring…and then, there is the sound of people laughing at a wedding. Mazel Tov Lynne and Ina! I usually spend my birthday weekend in Big Bear...but this year that would have meant missing two Sparks games and singing in choir for Sunday service (we only sing once a month). So, instead I spent two weeks putting together a slide show to play on the movie theater screen behind the choir, while we sang Kokomo. Here's the link to dot photo show of my slide show (choir music and all).